Cable Expert (Model No. 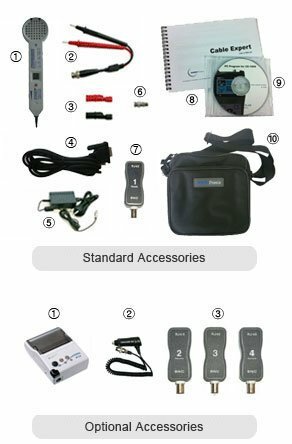 : CE-1000) NanoTronix Cable Expert (Model No. : CE-1000) is the all-in-one and easy-to-use network qualification unit measuring logical network performance and physical condition of network cables. It allows network engineers to install and maintain efficiently local area networks (LAN) with 10BASE-T and 100BASE-TX based on the Ethernet protocol. For measuring logical network performance, it provides the round-trip time (RTT) testing to measure network speed under dynamic and static configuration protocol and the IP scanning to show the information on all the terminals connected into the local network. It can also evaluate the capability of link partners such as supported network speed (10BASE-T or 100BASE-TX) and duplexity (half- or full- duplex). The device provides the physical information of the LAN cable under test such as cable length, faulty positions (open or short) and wire map (open, short, split, crossed and reversed). In particular, with the novel high-resolution graphic TDR (Time-Domain Reflectometer) and TDX (Time-Domain Crosstalk), it is possible for the users to locate faulty positions along the cable up to 500 meters. These TDR and TDX can also be utilized to any type of cables such as Coaxial cables for cable TV and HFC networks and Telephony cables. In addition, Cable Expert presents tone generating function used to identify cable connection and to trace cable in the walls, floors and ceilings, and continuity testing function to check out continuity of cable. With the graphic user interface supplied by 128x64 LCD and serial communication port, field engineers can easily apply the device to network testing, transfer the stored data to their PCs and print reports with optional thermal printers. Cable Expert has is housed in a rugged ABS enclosure and powered by Li-Ion chargeable battery with 6-hour battery life.